Albert Ferrer believes Michael Laudrup's success as Swansea manager has attracted the interest of both his former clubs Real Madrid and Barcelona. The Swans clinched a place in the Europa League by beating Bradford 5-0 in the Capital One Cup final on Sunday. Laudrup, who has one more year on his contract, has been linked with Real Madrid and Chelsea. "He could go to Real Madrid or Barcelona," said Ferrer, the former Barcelona and Chelsea full-back. "He has been a player of both teams. Barcelona supporters and Real Madrid supporters all love Michael Laudrup because of the way he is. "So he could end up in any of those two big teams." Laudrup has a contract until the summer of 2014 and has reiterated his intention to stay in south Wales for a second season. But the 48-year-old recently won 72% of the votes in a poll among Real Madrid supporters on who should succeed Jose Mourinho at the Bernabeu. Laudrup, who won a league title with Real Madrid in 1995, is ahead of Chelsea manager Rafael Benitez and Paris St-Germain's Carlo Ancelotti in the poll of Madrid supporters. 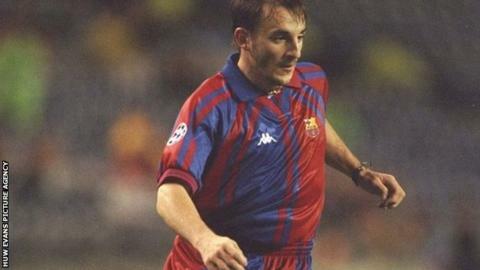 But Ferrer, who won 36 caps for Spain and played for Barcelona for eight years before he moved to England to play for Chelsea until he retired in 2003, believes the Catalan club will be also monitoring Laudrup's situation in Wales. Laudrup won four straight La Liga championships with Barcelona as a player and their current manager Tito Vilanova is in New York receiving treatment for cancer and is not expected back at the club until March. However, Ferrer admits he is not sure Laudrup will want to leave Swansea for the stress of life at two of the biggest clubs in world football. "I think they can go for Michael but I'm not sure if it's going to be his decision," said Ferrerr, who won five league titles, a European Cup, Uefa Cup Winners Cup and two domestic trophies with Barcelona. "He is very happy at Swansea and is very happy working in the Premiership. I don't know what he is thinking but if he was to take a big project and be under pressure week after week, is that something he really wants to do? "He has already managed in Spain, he was the manager of Getafe and Mallorca, so he knows the Spanish league perfectly well. "The success he has had with Swansea is more [about] the success in the way they play football. That is really attractive for the big clubs."